What does the media say about the New Iraqi Dinar? Media has played an active role in encouraging as well as discouraging positive thinking regarding Iraq and its potential as a country. Since the New Iraqi Dinars were issued, thousands of articles have been written by all major newspapers stating facts but also opinions. Opinions about Iraq and its new currency vary dramatically, but facts remain the same. I suggest that you focus more on the facts and data provided through this website or other sources, as this would be the best way to form an independent opinion. 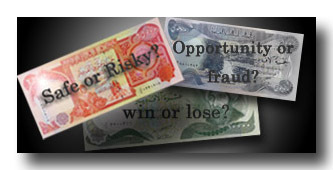 Any subject can be viewed from a number of different angles and the New Iraqi Dinar is no exception. Once you feel that you know enough then you can make a decision based on YOUR opinion. But remember.. hear the opinions but pay attention to the FACTS.. The articles below represent recent views from the media on the potential of the New Iraqi Dinar and the future of Iraq. The list will grow as more news about the iraqi dinars arrive. NY Post - Why is there media misstep on the Dinar? BBC News - Iraqi Dinar reaches post war high!